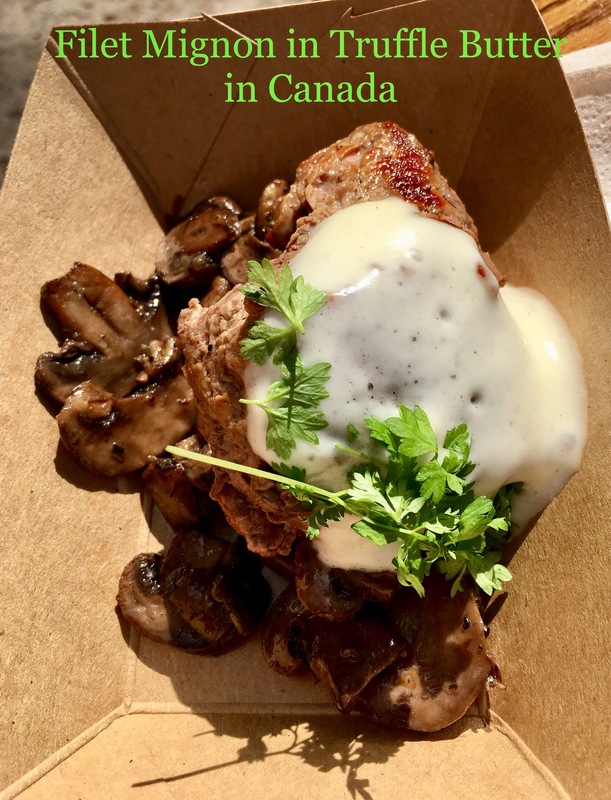 Epcot International Food & Wine Festival – Eat, Drink, and Go! Eat and drink around the world without actually needing a passport! 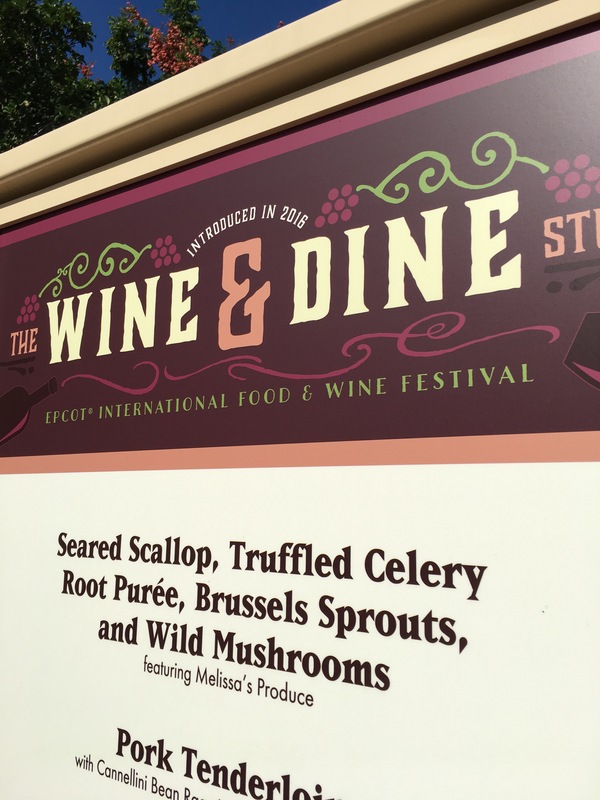 A few friends who know that I live for good food and drink recommended that while I’m in Florida, I check out the Epcot International Food & Wine Festival, which takes place in the fall from mid-September to mid-November. Perfect timing for my family trip down there over Halloween!! So here’s the deal – you have to buy a park ticket to get in because the whole thing is inside of Epcot in the various countries. This will set you back $100 a pop. So I don’t recommend bringing everyone, just a select foodie partner because splitting the samples was the best way to taste more. The food and beverages tasting deal – you can either pay a la carte (food ranges from $3.00 – $9.00 per portion, drinks range about he same) or you can get a book of tickets that are good for one sample each. This means if you want to pair the food and the beverage recommended, it’ll be two tickets. Ticket packs were $60 for eight or $116 for sixteen. Sixteen worked out perfect for me and my partner foodie. Get the sample pack and use those tickets on the most expensive items, then pay cash for the cheap stuff you want to try. 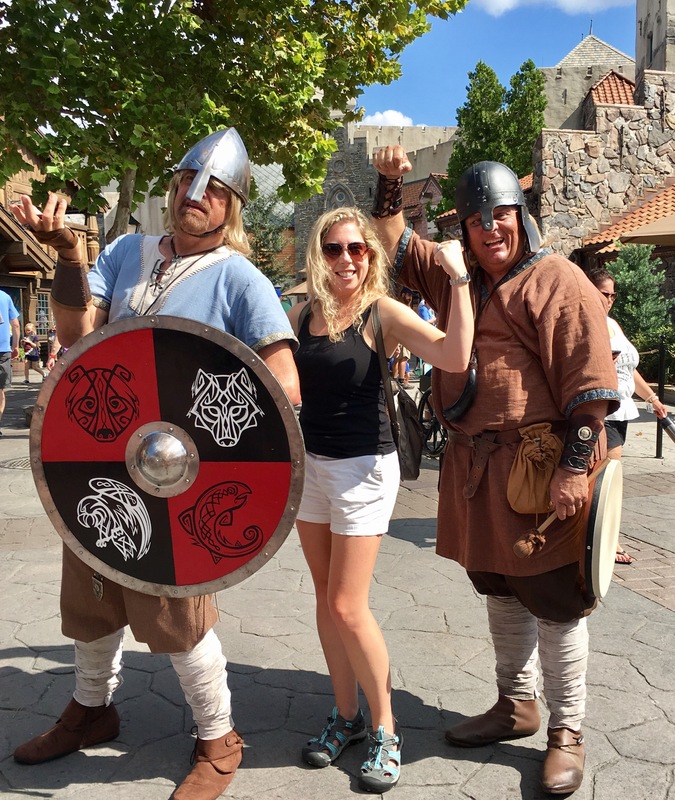 What’s easy is that Epcot’s World Showcase where all the countries are is one big circle, though these nice Vikings helped me find my way. How do I get to Australia from Norway?? Hehe. 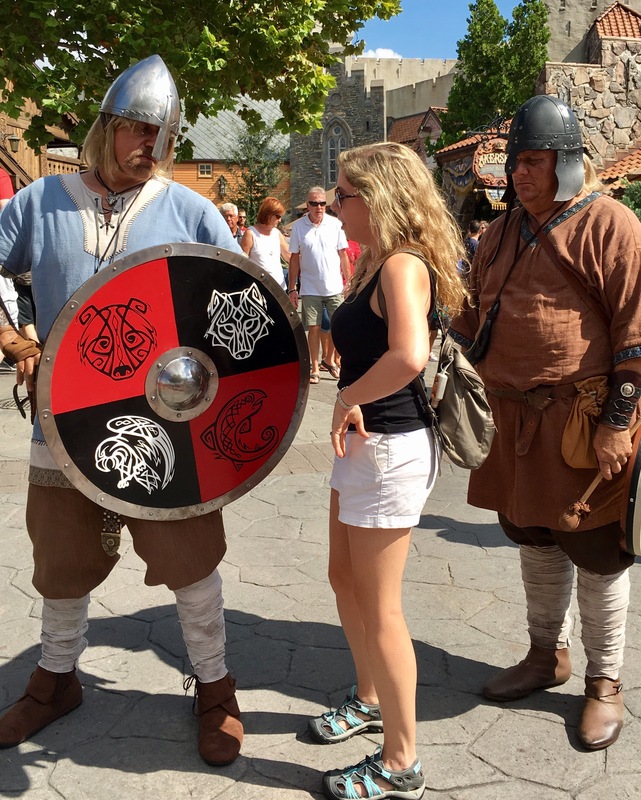 They didn’t speak English, so we just made motions, flexed our muscles, and then we were friends. We obviously couldn’t try everything, so we reviewed the offerings and started on one side, making our way around the world. Our first stop near the entrance was the new this year feature, the Wine and Dine Studio. Not a country per se, but a good collection of fine American sample fare. 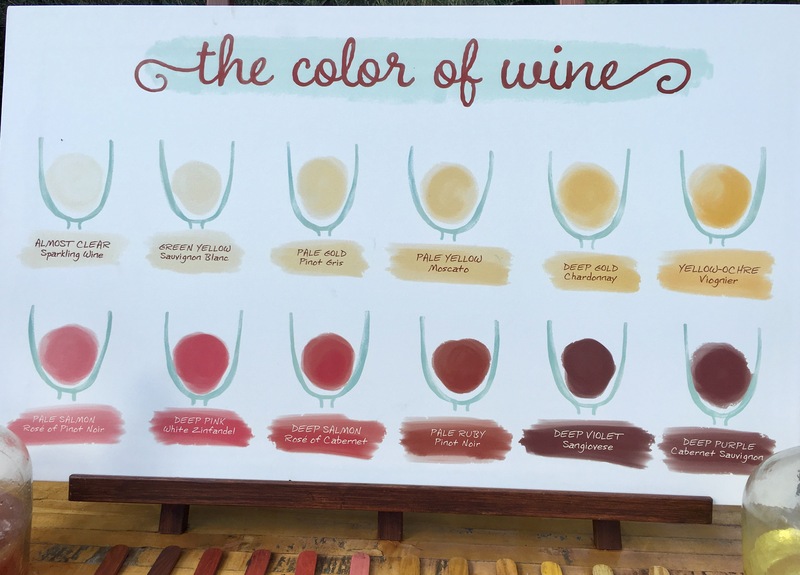 They had a wine color display that I will probably refer to in the future for wine tastings, so I thought I’d share it with you too! I was really interested in the truffled celery root purée, so we went for that. We didn’t do a drink pairing at each stop, only where the pairing was irresistible. 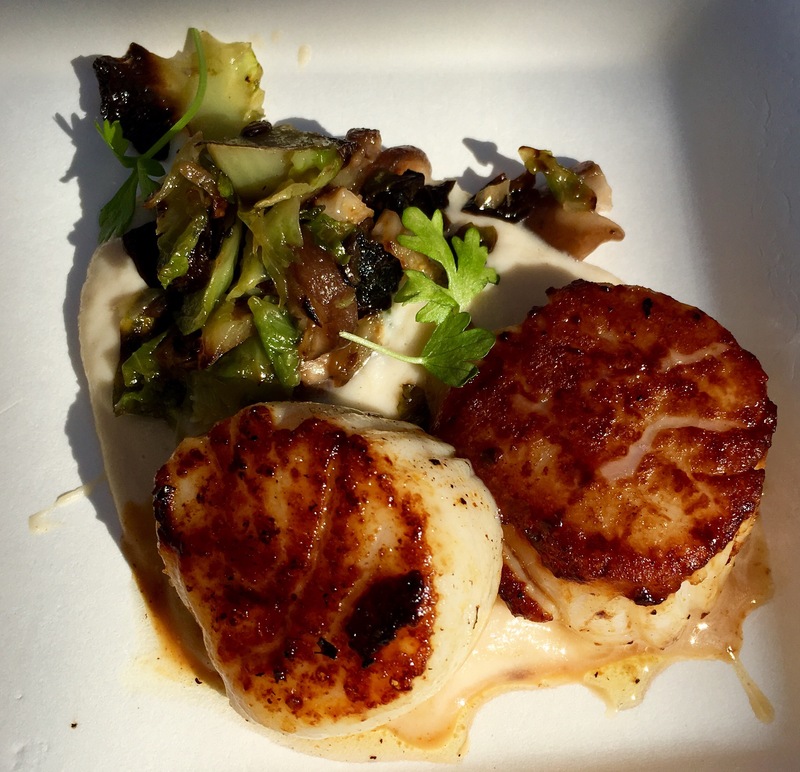 I was very impressed at the sear on the scallops and the delicacy of the plate – considering it was being prepped on the fly, it was very well executed. Our palates were warmed up with this delicious scallop and veg plate (see menu above) and I started getting very excited about the global foodie adventure ahead!! 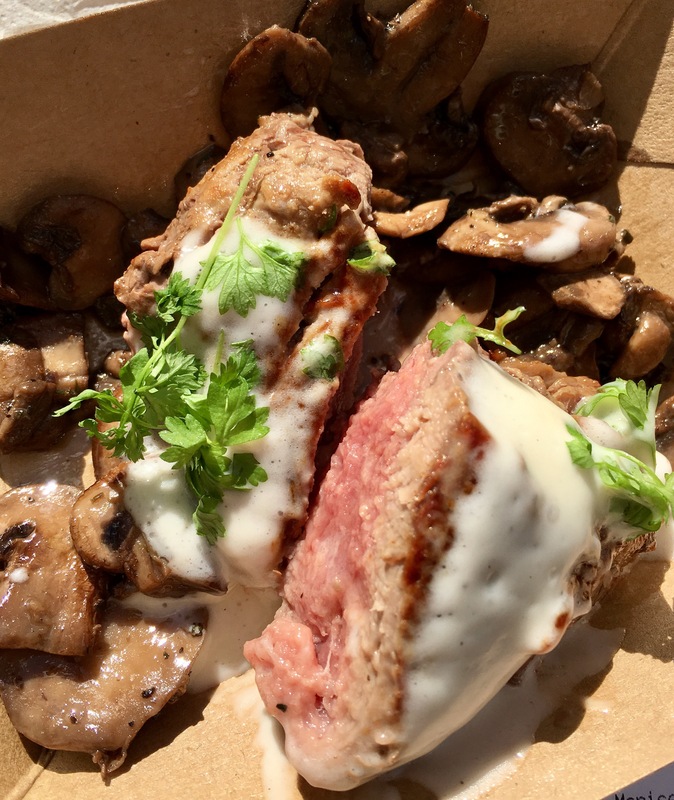 Our next stop was Canada for the Wild Mushroom Filet Mignon with Truffle Butter. We all know I have a soft-spot for anything Truffle, so this was an obvious selection. Impressive was the sear, again on the fly, providing us with a perfectly portioned rare hunk of carnivorous goodness. I actually asked for one of the more rare steaks, and there was no problem pleasing me! The chef took one off the grill just for me and plated it before my eyes with careful, delicate speed. The mushrooms were deliciously buttery nuggets embraced by the Truffle Butter that was generously sauced over the dish. This was one of my faves for sure. The portions everywhere were perfect for two to split. While the typical pairing with filet would be a silky red wine, I went a different way and popped across the walkway to Scotland for their Innis & Gunn Irish Whiskey Aged Stout. Don’t discount the value of pairing a stout beer with red meat, provided you like stout beer. This gave a delicious finish to the Truffle and steak flavors. Next came France for Boeuf Bourguignon. Cabernet Sauvignon-braised short ribs over mashed potatoes. The potatoes were meh, but the beef was yummm!! Please do not look at what I paired this with – totally sacrilegious I know, but it was pretty hot out. And technically it was offered in France! Did you know Grey Goose is made in France? I did, and so finding a good Goose slushy cocktail seemed right. Even though I know it was wrong. You’re right, I should have had a cab, but I was hot and maybe not thinking straight! After all this meat, it was time for a palette cleanser. 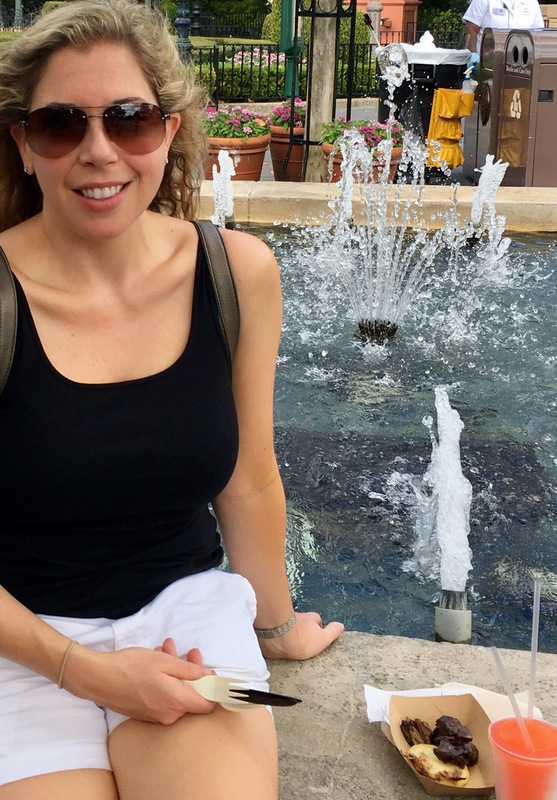 Prosecco in Italy, of course!! Ciao Bella! I love how people talk to you in Italy (yes, I’ve been to the real Italy a few times, and it’s probably my favorite part of Europe). I love Prosecco. And champagne. When you don’t know what you want to drink but you know you want to drink, champagne goes with pretty much everything. I particularly love it with oysters and shellfish (see blog a couple weeks ago), but it’s also great just by itself! 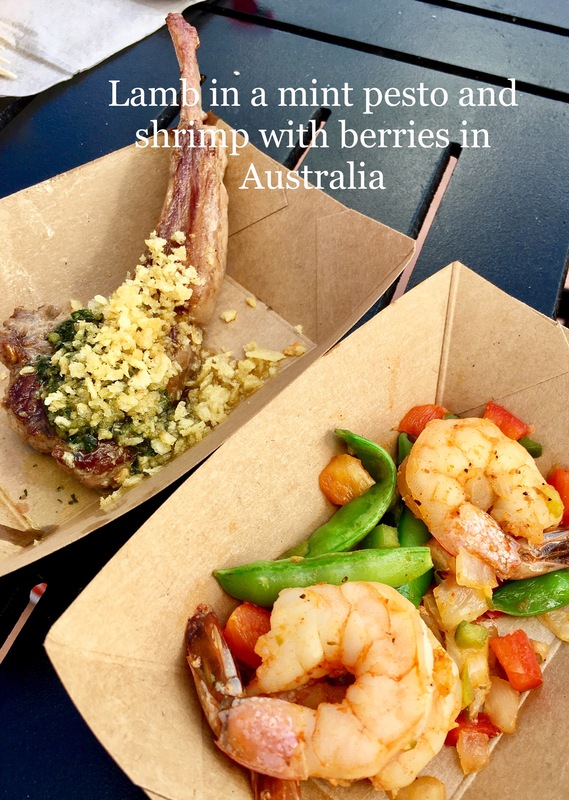 We made our way down under to try two dishes in Australia that caught our eye. The lamb was, unfortunately, a bit overcooked for my liking, but the mint pesto was really tasty. It was topped with potato crunchies, but those could have been omitted. The shrimp was grilled with a sweet and spicy flavor, “bush berry” was what drew my attention, but I didn’t think it was a real standout. New Zealand was next and this was very exciting – venison loin with a wild mushroom Marsala sauce over a Kumara dumpling. 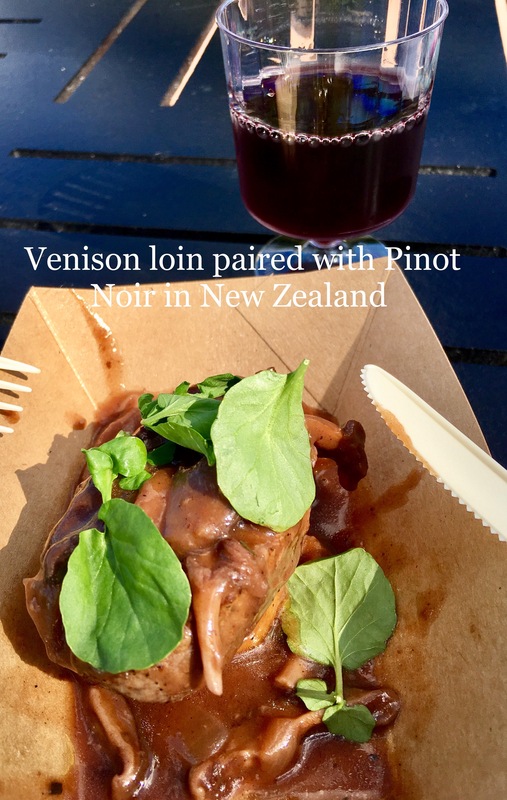 The venison wasn’t gamey, it was very tender and dense, and pairing it with the Pinot Noir was perfect. The mushroom Marsala sauce was absolutely delicious. Umami galore! I am going to try to copy this someday at home. This was my favorite pairing of the day. 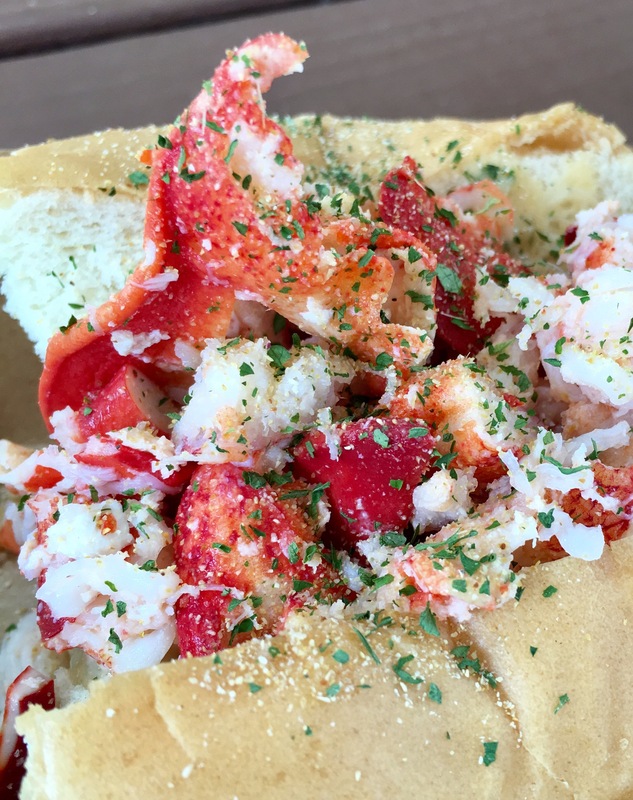 We also tried a simple lobster roll in the American Adventure locale, cause who can resist a lobster roll? Decent, but a little bread-heavy. 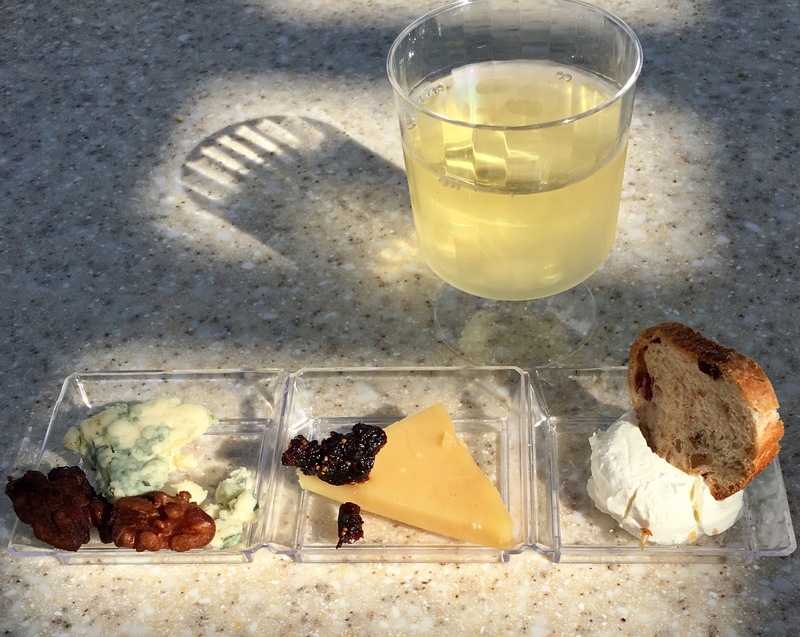 We rounded out our tasting adventure with a revisit to our first stop – the Wine and Dine Studio – to finish with an artisan cheese trio and Chardonnay. Nothing beats wine and cheese. The cheeses were perfectly complimented with with their own accompaniment. The goat with cranberry toast, the cheddar with fig compote and the blue with candied walnuts. Mmmm! The Chardonnay was from Kurt Russell’s GoGi wines, so I couldn’t resist a wine named after his gal, “Goldie” Chardonnay. How sweet! Maybe someday someone will name a wine after me!! I’m not a huge chard fan, but this was was good and it paired nicely with the cheeses. 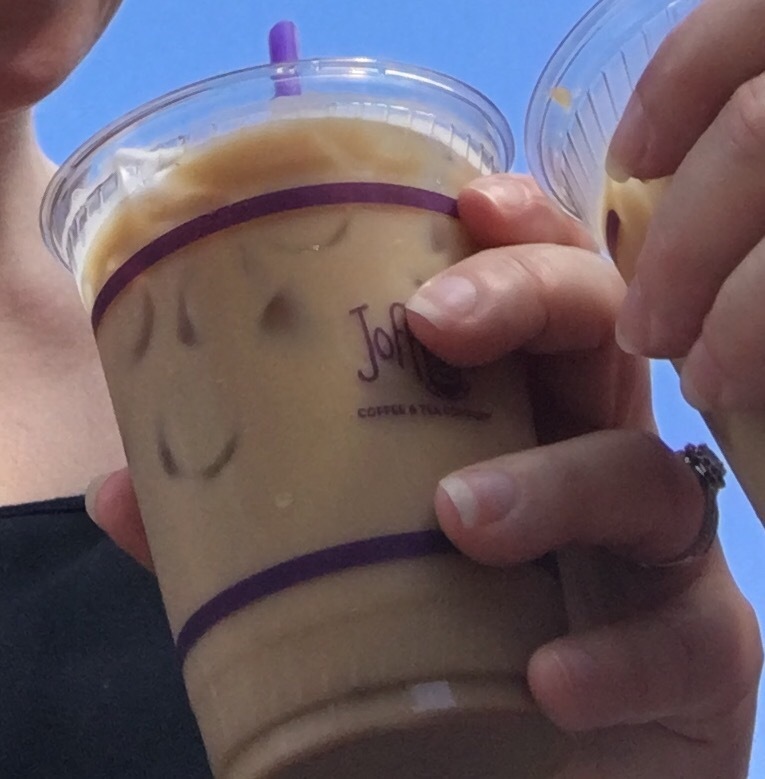 We debated about whether to do chocolate when looking at our last two sample tickets and, instead, decided to each get one final finish to the taste-around-the-world Adventure: the Kahlua-Tini Iced Coffee. It was so hot in the Florida late afternoon sun and this was the absolute perfect finish!! Our trip “around the world,” tasting the international food and drink offerings, was a blast! If you’ve got the money (this wasn’t a cheap trip, though of course cheaper than actually going to all these countries!! ), the time, and the appetite, it’s a great foodie adventure! !